Did you know that May 20 was Be a Millionaire Day? I certainly didn't know that there was such a thing until Jan Penny, who is hosting the May 2016 SGC Challenge, pointed it out. And that is the theme of her challenge: to scrap what you would do if you had a million dollars. Realistically, I'd (1)retire and (2)move closer to my grandchildren, but we're fantasizing here, so I've decided that I'd grab me some island space in the Caribbean and let the grandchildren (and their parents and uncles) come to me. I've been doing some cleaning and organizing of my scrap room and I came across this wonderful collection by 7 Dots - perfect for my subject. Add some cheesecloth and a bit of blue netting (thanks, Jen Snyder!) and a few shells from a shop in Provincetown, Cape Cod (thanks to my SIL Linda Wood for taking me there) and some scattered pearls and there you have it - my Million Dollar Dream. Jan added a few twists; I've done them all. 1.Use the word million in your title. I've actually put the title on my page: Million Dollar Dream. 2.Use purple on your project. There are hints of purple around the edges of the paper and one of the last of my Blue Fern Studios flowers from the April kit next to the photo. 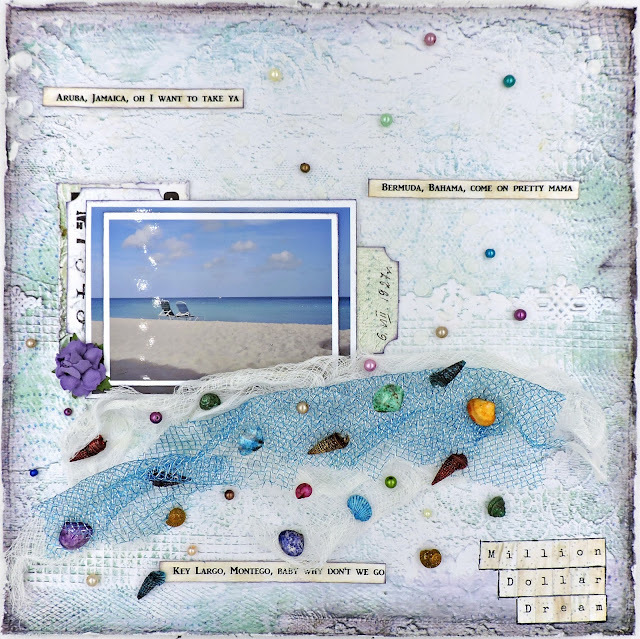 I've also inked the edges of my photos and elements with Dusty Concord Distress Ink and scattered purple pearls and shells around the page. 3.Use a song title or lyrics. I'm assuming that you all recognize the lyrics that I printed out and placed here and there.